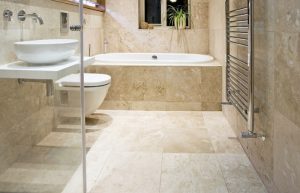 Your natural stone floor is a significant investment and, if properly maintained, should look beautiful for a lifetime. Our certified professional cleaners can shine and restore almost any natural stone surface — indoors and out! 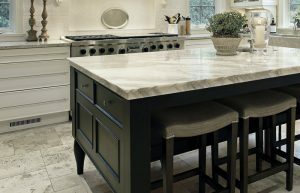 Call us today and let our certified stone and tile experts provide you with a free estimate, evaluating your floor and educating you on how you can restore and protect this important part of your home for years to come. Saltillo pavers are beautiful tiles handmade from clay dried in the hot Mexican sun. As with all natural stone, no two are alike. But years of wear and tear can dull and wear away Saltillo’s beauty, and often old finishes begin to flake off or appear soiled. Our Saltillo restoration process has rave reviews for its stunning results. We begin by stripping any old finishes off the floor, then cleaning the tiles and grout before applying a high gloss topical sealer to give the Saltillo a glossy wet look and enhance its natural colors and variations. If you have a dull and dirty Saltillo floor, don’t wait any longer. Call our skilled professional cleaners today for a free estimate and let our nationally certified stone cleaning experts show how your home can be transformed in a lasting and dramatic way. When properly maintained, Travertine is a beautiful choice for indoor flooring. If neglected, however, sand and other hard soil will wear and dull this soft stone and make it appear constantly dirty and scratched. Our stone restoration experts can remove years of scratches and wear, then refinish your floors to look brand new. We start by diamond honing the travertine, then gradually bringing the floors to the level of shine you desire, anywhere from a matte finish to a stunning mirror-quality shine. After your travertine is cleaned, honed and polished, we often apply a premium penetrative sealer to protect against future deterioration and staining. Call us today for a free evaluation and estimate. We look forward to transforming your home soon! If you have stains, etch marks or damage to your marble or granite floors or countertops, our nationally-certified stone restoration experts most likely have a solution. Using the wrong cleaning agents on your granite or marble countertops and floors can cause permanent – and expensive – damage. Alamo Steam Team only uses the highest quality solutions, sealers and enhancers on your marble or granite countertops and floors, and our experts know when and where to use them, providing you with the absolute best and safest natural stone restoration cleaning available. Call our professional cleaners today and find out about our free natural stone restoration evaluation. Trust the experts to restore your stone installations to look their best and last their longest! Schedule your appointment with the Alamo Steam Team today to get started.